One of the iPhone 6s and iPhone 6s Plus big headline feature is its new camera. Bumped to 12-megapixels, the new shooter is also the first in an iPhone to be capable of recording 4K Ultra HD video, though you might not know about it if you just picked up a new handset and started recording with it. That’s because Apple has set the default recording values for the new iPhones to be 1080p at 60 frames per second. The decision to not set 4K as the default likely comes down to the sheer amount of space 4K video takes up, especially given the fact that Apple still insists on selling a 16GB iPhone as the entry level model. 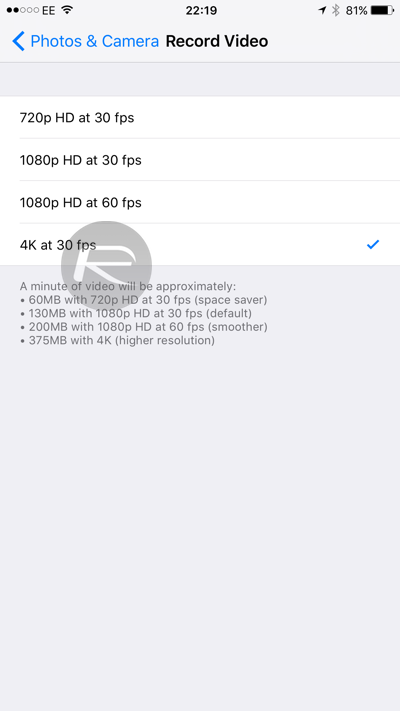 If you bought your new iPhone with a mind to record video in 4K though, you’re going to need to head into the phone’s settings in order to flick the switch that tells the software to take advantage of all those extra pixels. Here are the buttons you need to tap and the switches you need to flick in order to activate 4K video recording on your new iPhone. Step 2: Tap Photos & Camera. Step 3: Now tap Record Video under the Camera heading. Step 4: Tap the option which mentions 4K at 30 fps. And you’re done. With this setting switched on, all of your recorded video will be shot at the full 4K resolution, the highest resolution the new 12-megapixel camera is capable of. 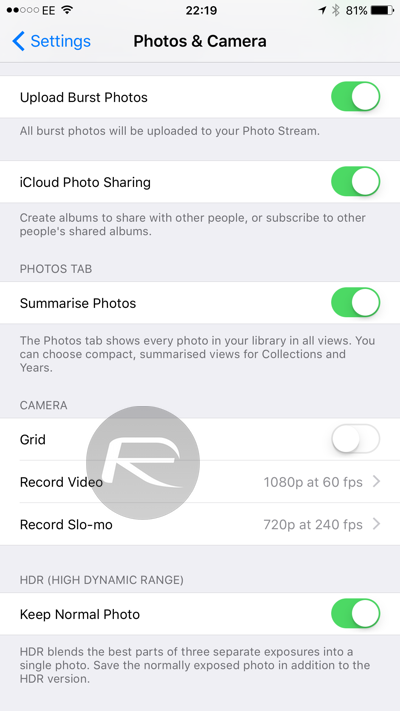 Given the amount of storage needed for recorded 4K video you may wish to switch that on and off depending on the content that you will be shooting, though if you’re the owner of a larger capacity iPhone then you may have the luxury of not not having to worry about such things. So come on Apple, maybe it’s time to dump that 16GB model. 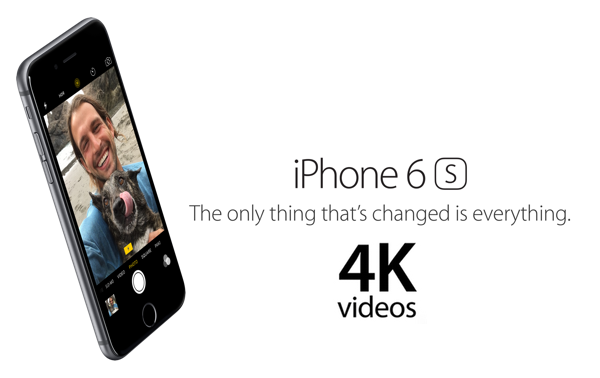 4k video is cool but then iPhone should have started with 32GB’s atleast. no great fun in shooting the 4k in iPhone then transfer it to iTunes and view it. Looks like apple has launched some features without keeping in mind the limitations attached. Nobody buys a 16GB anymore. Very true, but why do you care? If you need more space, buy more space. It’s the repetitive sales of the lower end storage units that keep Apple producing the 16GB models. Where there is demand, there is supply. You think if everyone stopped buying the 16GB models, they will keep manufacturing it? This is probably your best critique comment. I will respect this one. A lot of business iphones are 16gb. Businesses generally don’t care for storage for apps, music or photos etc. What I’m trying to understand is why do these phones let you shot “4K” (Ultra HD) when you will not be able to see the true resolution on phone screen that only has a resolution equivalent to 1080p at best. That also for iPhone 6s plus. 6s even is lower than 1080p. This is what happens when the left hand does not know what the right hand is doing. Apple was once a one brain company. After Jobs era apple gave the innovation job to many brains thus ending in total disarray and disagreements. After Jobs apple events are so laughable that even Cook can explain the Command+c feature as a very amazing and never tried before feature. Innovater has a target and archiving it never mentions the small improvements. For a salesman every minor improvement is a big innovation. Because you can mirror it onto a 4k TV, no? How many videos do you watch on your Nikon or Canon camera screen? Watching 4K on a 4-6″ screen is a waste since retina display resolution is the highest resolution your eye can recognize at that screen size. Anything higher would be a waste of pixel space. The purpose is to shoot video and render/edit it on your computer. Yes very well put. I agree with the 32GB argument too.